What are Glyco-Flex Soft Chews? Safe use in pregnant animals or animals intended for breeding has not yet been proven. 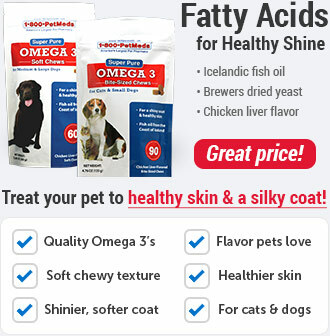 Consult with your veterinarian before using this product in animals: with clotting disorders; being treated with anticoagulant medications; diabetes; or any metabolic disorder causing hyperglycemia; history of urinary tract stones; known allergies to shellfish. 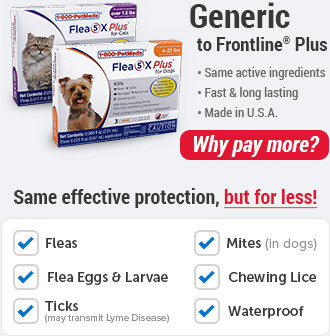 Glyco-Flex II Feline (Per 2 Soft Chews); Perna canaliculus (GlycOmega brand Green-Lipped) Mussel (300mg), Methysulfonylmethane (MSM) (250mg), Glucosamine HCl (Shrimp and Crab) (250mg), N,N Dimethylglycine HCl (DMG) (50mg), Manganese as Mn Proteinate (5mg), brewers yeast, canola oil, chicken liver flavor, citric acid, glycerin, mixed tocopherols, propionic acid, proprietary blend (maltodextrin, sodium alginate and calcium sulfate), rosemary extract, silicon dioxide, soy lecithin, vegetable oil, whey. 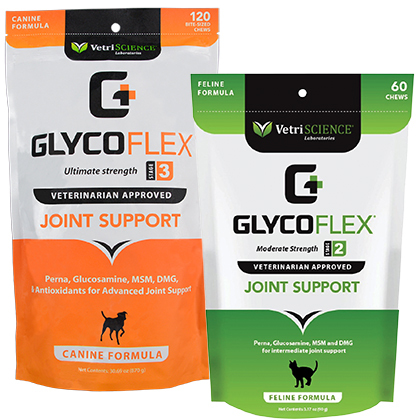 Glyco-Flex III for dogs (per 2 soft chews); Glucosamine HCl (1000mg), Methysulfonylmethane (1000mg), Perna canaliculus (Green-Lipped) Mussel (600mg), N,N Dimethylglycine HCl (100mg), Vitamin E (50IU), Ascorbic acid (24mg), Manganese as Proteinate (10mg), Grape Seed Extract (5mg), L-Glutathione (2mg), Selenium (0.002mg), brewers yeast, canola oil, chicken liver flavor, glycerin, natural mixed tocopherols, propionic acid, soy lecithin, SureSweet (maltodextrin, sodium alginate and calcium sulfate), whey. Glyco-Flex II Feline is recommended for adult or maturing cats, cats with a moderate need for joint support, or as a follow up to orthopedic surgery. 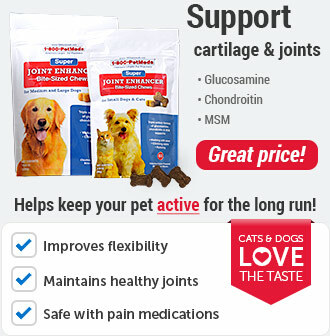 Glyco-Flex III for dogs is recommended to provide joint and connective tissue support for all stages of life. Glyco-Flex II Feline and Glyco-Flex III Soft Chews are chicken liver flavored, non-prescription (OTC) products. 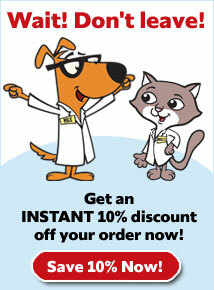 The usual dose of Glyco-Flex II Feline for the first 4-6 weeks is 2 Soft Chews per 10 lbs of body weight, daily. After the initial period, give a maintenance dose of 1 Soft Chew per 10 lbs of body weight, daily. If giving more than 1 chew, divide between AM and PM. The usual dose of Glyco-Flex III Soft Chews for the first 4-6 weeks in dogs up to 30 lbs is 1 soft chew daily. For dogs 31-60 lbs use 2 soft chews daily, for dogs 61-100 lbs use 4 soft chews daily and for dogs 101 lbs and over use 5 soft chews daily. The maintenance dose for dogs up to 30 lbs is 1 soft chew every other day, for dogs 31-60 lbs is 1 soft chew daily, for dogs 61-100 lbs is 2 soft chews daily, for dogs 101 lbs and over is 3 soft chews daily. If giving more than 1 soft chew daily, divide between AM and PM. 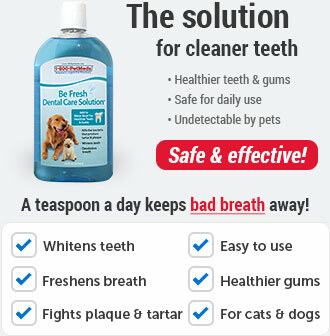 Administer Soft Chews during or after the animal has eaten to reduce the incidence of gastrointestinal upset. This product is for animal use only. Safe use in pregnant animals or animals intended for breeding has not been proven. Consult your veterinarian before using this product in animals with clotting disorders or being treated with anticoagulant medications, diabetes or any metabolic disorder causing hyperglycemia, history of urinary tract stones, known allergies to shellfish. If lameness worsens, discontinue use and contact your veterinarian. Glucosamine, in humans, may increase insulin resistance and consequently affect glucose tolerance. Diabetic dogs or dogs that are overweight and have problems with glucose tolerance should have their blood sugars monitored if they are given glucosamine supplements. 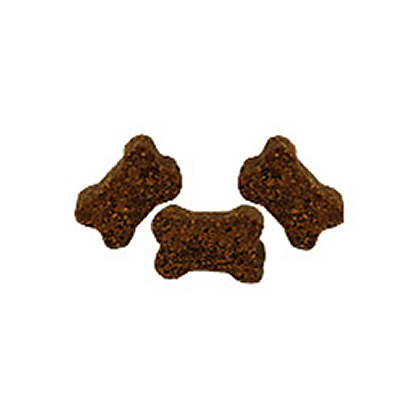 Glyco-Flex Soft Chews should be given with your pet's food. 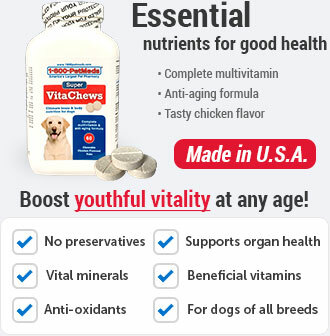 Give 2 soft chews per 10 lbs of pet's body daily. Give 1 soft chew per 10 lbs of pet's body weight daily. Other Ingredients: Brewers yeast, canola oil, chicken liver flavor, citric acid, glycerin, mixed tocopherols, propionic acid, proprietary blend (maltodextrin, sodium alginate and calcium sulfate), rosemary extract, silicon dioxide, soy lecithin, vegetable oil, whey. Other Ingredients: Brewers yeast, canola oil, chicken liver flavor, glycerin, natural mixed tocopherols, propionic acid, soy lecithin, SureSweet (maltodextrin, sodium alginate and calcium sulfate), whey.